If like me, you've never visited Northern Ireland, take my advice and go there immediately! I arrived at Belfast's International terminal to discover an oasis of green rolling hills and fields surrounding a city that boasts more interesting architecture, live entertainment, theatre, exhibition spaces, museums and friendly open people than most other places I've been to. Gallery and Events Officer Leo Devlin was there to welcome me at the offices of the Arts and Disability Forum (ADF) and give me a quick tour of the exhibition space and other facilities that we'd be using that afternoon. I'd only previously corresponded with Leo by email and it was great to actually get to meet him face to face. Organised primarily by Chris Ledger (Chief Executive) and ably assisted by Leo and Michelle Henry, ADF's Finance Officer, an exhibition of my cartoons entitled ‘The world of Crippen’ was scheduled to kick-off that afternoon. This was to follow a short introductory talk about my work in the meeting room upstairs. The folks at ADF had done a lovely job on the cartoons; framing them in matt aluminium and hanging them on the purpose built display boards that were set around the exhibition space. Before people started to arrive I had a chance to chat with Chris and Leo and learn a bit more about the organisation. With strong links established with other arts organisations, ADF seems to have become the main focus for disability arts in Northern Ireland and had an impressive schedule of exhibitions and installations planned. Speaking later to Noirin McKinney, who's the Director of Arts Development at the Northern Ireland Arts Council, she expressed her admiration for what had been achieved by the ADF team in a relatively short space of time. The introductory talk was opened by Margaret Mann, Chair of ADF who welcomed representatives from many of the City’s allied organisations including Queer Action and Open Arts. The talk ran over time as visitors to the exhibition questioned me about events taking place within mainland Disability Arts, especially where art was being used to confront the inequality of life for Disabled people. The ADF team had already started to raise awareness regarding the concept of disabling barriers within society and how disabled artists could use their art to confront these. My cartoons had been selected to reinforce this theme and they seemed to have helped generate a positive and empowering effect upon visitors to the exhibition. A further welcome was provided by Noirin McKinney of the NI Arts Council who encouraged visitors to mingle and discuss the work on display whilst enjoying the refreshments that had been provided. A canvas containing a huge question mark had been framed and hung on one of the walls within the exhibition. Beneath this was a box with a postal slot set into it. The purpose of this was to invite visitors to the exhibition to post a suggestion for a new Crippen cartoon to be created. This had to relate to a disability related situation currently taking place within NI and which then could be presented to the appropriate political or charitable representative as part of a wider campaign. 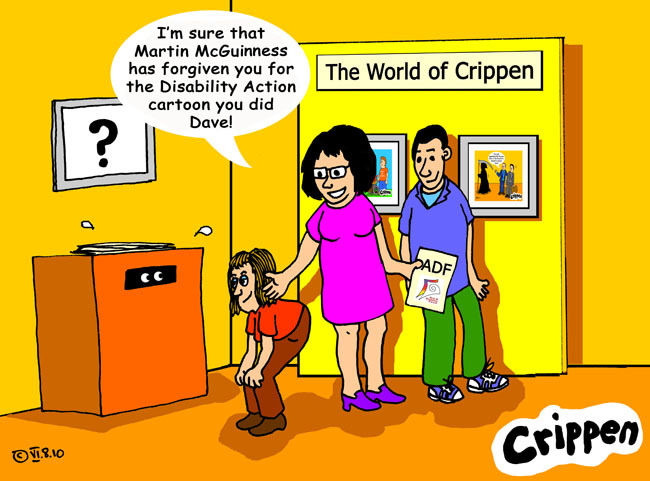 The exhibition, entitled ‘The world of Crippen’ is staying at the ADF premises for a few more days before touring other disability related bases in NI. The individual limited, framed prints are for sale with all proceeds going to ADF to fund their continuing programme of disability arts for NI. For myself, I found the enthusiasm and energy that was being channelled at ADF gave me a huge boost and a determination to return in the near future for further collaboration with them.